I would like to thank you for the hunt of a lifetime! I looked from Texas to Michigan for my 2000 hunt, but I'm glad I happened to find your web site and hunt with you in Mississippi. I have hunted my entire life, but I have never had the excitement and adrenaline pumping action I experienced at Harriswood. I could have left after the first evening hunt and been satisfied with the trip. After jumping 4 Axis deer and 10 whitetails on the way to the stand, I knew I was in for a treat. According the the time on my camcorder, we started seeing deer within 6 minutes of being on the stand, and continued to see deer until dark. I must have seen at least 50 animals that evening with 20 or more being bucks - HUGE BUCKS! I recorded several bucks sparring, and tending a scrape, which was especially exciting! I was ecstatic after taking the high-racked, 200lb 8 pointer on Monday, but as I soon learned, the action was just beginning. The events leading to taking the huge 10 point on Tuesday was one of the most exhilarating, adrenaline pumping events of my entire life! After 2 trophy 8 points entered the food plot, my huge 10 point approached, but he was slightly out of range. During the few minutes I waited for him to get closer, 4 more trophy 8 points, a 9 point and a spike entered the plot all out of the same path. I have never seen so many trophy bucks in one spot in my life. (I'm glad I got it on tape or my friends would not have believed me.) As if this was not enough excitement, taking the unbelievable red stag on the last hunt was icing on the cake. The 7x7 stag with a 2 1/2 foot inside spread was more than I could have imagined. The hunts were so exciting I almost forgot to mention the first class accommodations that Claire and I enjoyed during our stay at Harriswood. The food was great, the service was great, and the guides were great! 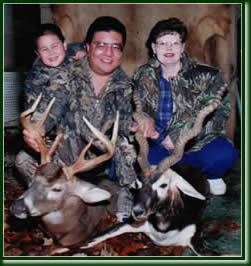 We really enjoyed the good times and good hunting we had with you, George and Danny. Since Claire was seven months pregnant, she could not get in a stand, but amazingly she was able to see more than 40 deer just looking out the windows of the house. We both truly enjoyed our stay, and it was truly the hunt of a lifetime. I hope we can top it next year! Nancy, Dustin and I would like to thank you and your very professional staff for the most enjoyable hunt we could have dreamed of. 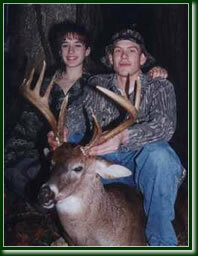 We have hunted all over the world but Harriswood was the ultimate. 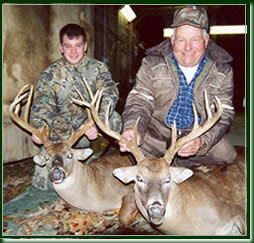 The number of trophy whitetail at Jacks place was unbelievable. I told him the class of buck I wanted. He held me back until we found him. The 11 point I took was the most perfect deer I have ever laid eyes on. 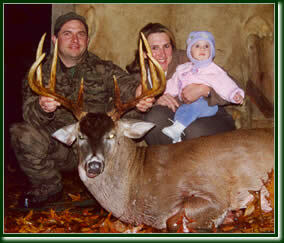 I saw more trophy whitetails at Harriswood than most people will see in their lifetime. After I took the whitetail I wanted. I went after the Axis deer. If it had not been for Jacks professional staff. I would have taken the wrong one. 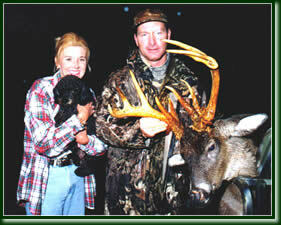 But they encouraged me to wait for a bigger deer and when I found the one I wanted I was glad they did. The deer outweighed the Texas Axis I had hunted last year by at least 50 lbs. The horns had much more mass and was at least 8 inches to a foot taller. Even after I had made my 2 kills the hunt wasn't over yet. My wife and our 3 month old son wanted to go out with me. Jack and his staff made it possible. We all hunted our last afternoon at Harriswood in one of their very comfortable shooting houses. That afternoon I got the opportunity to show my wife and son, 8 monster Axis deer, one of which was in velvet, 5 trophy whitetails, and a large number of smaller bucks and doe. All of these deer were in the same food plot. Now that my husband has finished talking about the wonderful hunting, I would like to tell about the beautiful house and grounds. When we arrived at Harriswood I was so excited to see such a gorgeous house. Jack and Becky have out done themselves, decorating and making this a wonderful place to stay. Jack makes beautiful wood bowls and has placed some around the house and it adds the perfect touch. The chandeliers and furniture are absolutely breathtaking. The way we were taken care of made us feel like royalty. I enjoyed listening to the history of Harriswood and Jack is just as good a tour guide as he is a hunting guide. The food they served us was awesome. They catered to what we like and fed us until we could not eat anymore. Dustin had a great time, too! Thank you Jack and Becky for making us feel at home. We look forward to hunting with you next year. I have hunted for 25 years throughout a few different states and this was my first time in MS. I enjoyed the ease and simple hunting style Jack provided and enjoyed being able to glass many younger bucks throughout each day. The real nice thing about Jacks set up is No Shoot, No Pay. If you dont see a keeper you can always try another time. Jack did a great job of making us feel completely at home. Peace and tranquillity at its finest. 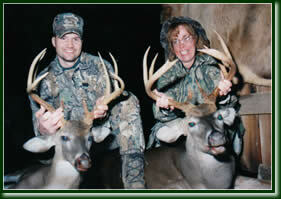 My wife and I are very fond of our memories of her first buck hunt. We were accompanied by our family, which range from teenager to infant. They were thrilled with the visit also. Jack took the time to provide interesting "things to do" for all. My four year old still talks about visiting Mr. Jack again. The cuisine is very good. Jack was responsive to everyone's likes and preferences and we were well taken care of in every respect. We are planning to visit Jack again this fall. Craig and I have always enjoyed spending time together. 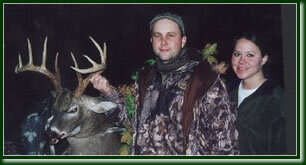 We have logged in many hundreds of hunting and fishing trips and have traveled a good part of the globe together. While most of these were enjoyed only a handful ended up being a truly special memory. Our time at Harriswood was one of these times. Even though one hunt started with terrible weather conditions, a warming trend with swirlish winds, we saw 12 does and 19 bucks within 2 hours (four 10-points and five 8-points)! 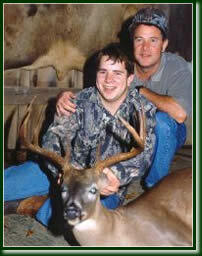 Being with Craig, 17, when he took his 10-point was what the trip was all about for me. Ive never enjoyed a trip more. My thanks to Jack and Becky Harris for providing a hunting opportunity in such a wholesome, family-orientated atmosphere, not to mention fabulous accommodations and gourmet food. 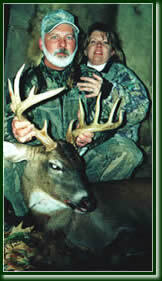 One morning my father and I headed to Pond, Mississippi, to go on a day hunt at Harriswood Plantation. I had no idea what I was in for. It started off like any normal day hunt. We began to load up at around 1:30 p.m. and were on our way for the stand by 1:45 p.m. Before we even got to the stand, we saw six rack bucks in a food plot. Between 2:00 and 4:30 p.m., we saw 18 bucks, 12 does, and 1 black buck antelope. At 4:30 p.m. my deer stepped out on the food plot and my heart started beating so fast that I couldnt hold my gun still. I finally calmed down and squeezed the trigger. After finding my deer, we went back to the house and ate a gourmet dinner. 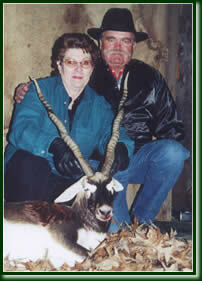 We then cleaned my deer, one axis deer, and one black buck antelope. This day was by far the most exciting day of my life! Faye, Becky, and I want to take a moment to tell you how much we loved our time at Harriswood Plantation. 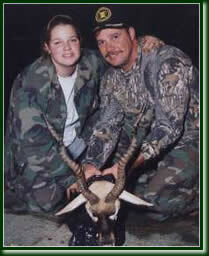 You made our daughters (Becky) first hunting experience (19 ¾ inch Blackbuck Antelope) one that will stay with all of us for the rest of our lives. 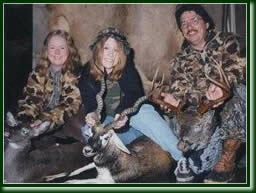 Not to mention Fayes Doe or my 17 inch spread 10 point Whitetail Buck. The food and accommodations at Harriswood are first rate, just like the hunting and we look forward to returning often in the years to come. 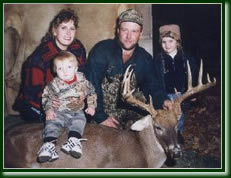 To find a place as special as Harriswood, where the total hunting experience is catered to the whole family, is truly unique. In closing, Jack we really enjoyed meeting your son Jackson. You had all the right advice when it came time to hunt and made the whole time in camp a lot of fun! Thanks Jack, see you soon." 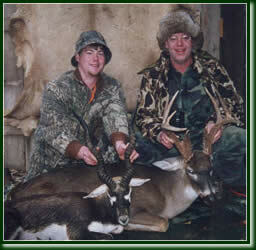 I have enjoyed hunting with my Dad at Harriswood for the last two hunting seasons. The first year I saw lots of animals but was really somewhat relieved that I never actually "got a clear shot." I didnt think I could actually pull the trigger but, last season I just couldnt resist that antelope. He just seemed to have my name all over him. I sighted it in, said a little prayer, and gently squeezed the trigger. The adrenaline I felt when I saw him fall was incredible. The excitement stayed with me for days maybe weeks. I will always remember the beautiful, still woods, the ever-so-green grounds, and the wonderful silence that hangs in the air. Thanks, Mr. Jack. 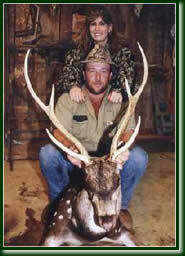 the privilege of seeing, as well as hunting the most beautiful trophy animals one could imagine. As a 20-year veteran of hunting all over South Louisiana, Mississippi, and West Texas, Harriswood is by far the most beautiful, stocked grounds I have ever hunted. This, coupled with spending one-on-one time with my daughter, has given me great pleasure time and time again. My daughter pretends she only hunts with me to have my undivided attention, but I know deep inside she has a love for the woods just like her father. I hope I get one more hunting season out of her before she becomes "boy crazy," but if not, the time we have spent together thus far will always be the happiest times I remember with her; and makes me look forward to hunting in the future with the grandchildren she will someday give me. I've been fortunate to have the opportunity to hunt at many great lodges located across the U.S. while hosting "The World of Ducks Unlimited" television series on The Nashville Network. In my new position as host of "Scott Liles In Pursuit - The Television Series," I have continued my hunting adventures to some mighty special places. I thought I have experienced some of the best lodges until I had the honor of spending a few days at Harriswood Plantation. The camera crew managed to capture plenty of big bucks, and the 10-pointer my nephew harvested was a thrill. Harriswood Plantation has become my favorite destination. The Plantation decorations were breathtaking and the beds are truly the most comfortable I've slept in. As much as I travel, finding a comfortable bed is a true blessing! In addition to providing all of the creature comforts a person could wish for, the whitetail hunting is nothing short of spectacular. I know you say it was slow during our trip, but capturing 15 to 20 big bucks on film each day is more than I dreamed of. Harriswood Plantation exceeded all of my expectations. I would like to extend my sincere appreciation and gratitude to both of you. I had a terrific time and I'm looking forward to another visit.